Jacqueline West, Author of the Books of Elsewhere » Cover Reveal: THE COLLECTORS. Coming from Greenwillow Books/HarperCollins on 10/9/18. Even the smallest wish can be dangerous. Do you see that marble in the grass? The tiny astronaut with one arm raised? The old-fashioned key in the gutter? Van sees them. Van notices all sorts of things. But usually no one notices Van. He’s small, and always the new kid, easy to overlook. But one day he watches a mysterious girl and a silver squirrel dive into a fountain to steal a coin. And—even more strange—they notice Van. Suddenly, the world changes for Van. It becomes a place where wishes are real. A place where wishes can be collected, just like his little treasures. A place where wishes can come true. But that’s not always a good thing. Not all wishes are good, you see, and even good wishes can have unintended consequences. And Van is about to find out just how big those consequences can be. My first middle-grade fantasy in four years (four years!?!) will be released by Greenwillow Books this fall, and I couldn’t be more thrilled. To all the BOOKS OF ELSEWHERE readers who have been patiently waiting for me to write something in same fantasy/mystery/adventure/eccentric-talking-animal ballpark: Thank you. To everyone who has asked me what I’ve been working on over the past few years and oohed at my sheepish description: Thank you. And to everyone at GWB/HC who is making this story into a real paper book at last: Thank you. I can’t wait to introduce you to Van and his world this October. In the meantime, look look LOOK at this gorgeous cover! Swirling mist! Sparkling stars! Mystery and magic! Who could ask for anything more?! Can’t wait!! 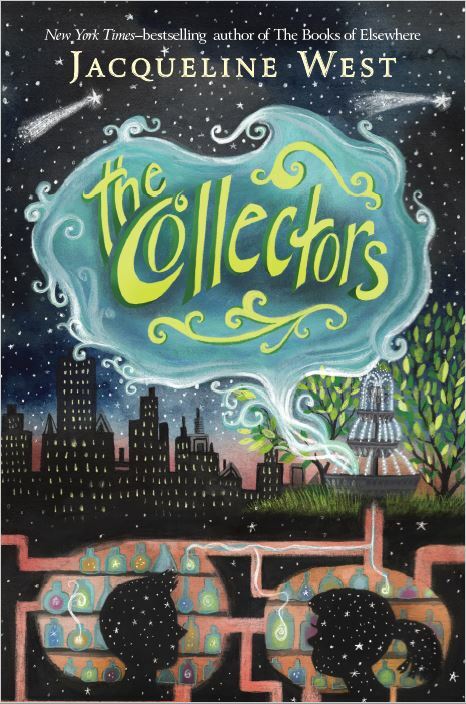 Love the cover and congratulations to The Collectors upcoming release. If only October didn’t feel so far away. Oh, thank you so much. And good luck with Camp NaNoWriMo! WriteWriteWrite!